Installation of rope cutter on shaft 2018. Davits extended for better dinghy lift 2018. New water heater system 2018 . Tools, engine & other spares included. Owner says : The interior hull areas of the yacht were inspected during her last refit in 2018. It was found that all interior hull areas were in excellent condition and well insulated. The interior has been coated with a product called aquaseal which is a bitumen like substance similar to that used in metal water tanks. This has then been covered with 50 mm thick expanded fiberglass insulation with an R2 insulation rating. The areas that are not insulated are: engine well, top of fuel and water tanks, forward bilge area and machinery area at the stern. These areas were cleaned and repainted during refit. New ultrasonic antifouling system with 4 sensors 2018. Full 20 m scaffolding boathouse, for low season covered dry berthing. Aft quarter berth cabin has been converted to a workshop. Old Gas stove is in storage and available to the new owner if gas is prefered. Newly installed (2016) a stainless steel 1 m long diving / fishing platform with stainless steel / teak ladder. Spare 4 Hp Yamaha 2 stroke outboard. Presenting in exceptional condition for her age, this professionally built, round bilge, steel, Adam 45 “Fat Adams” has a 4.5 m beam giving an incredibly spacious, light and airy saloon. Originally completed in 1989 but never used, as the first owner, a German perfectionist, found he was too busy on his farm to use the boat, so he took her home and parked her in his barn. She was rescued in 2004, by the owner of Townsville Shipyard ( Australia ), had a full professional refit and was relaunched in late 2005. 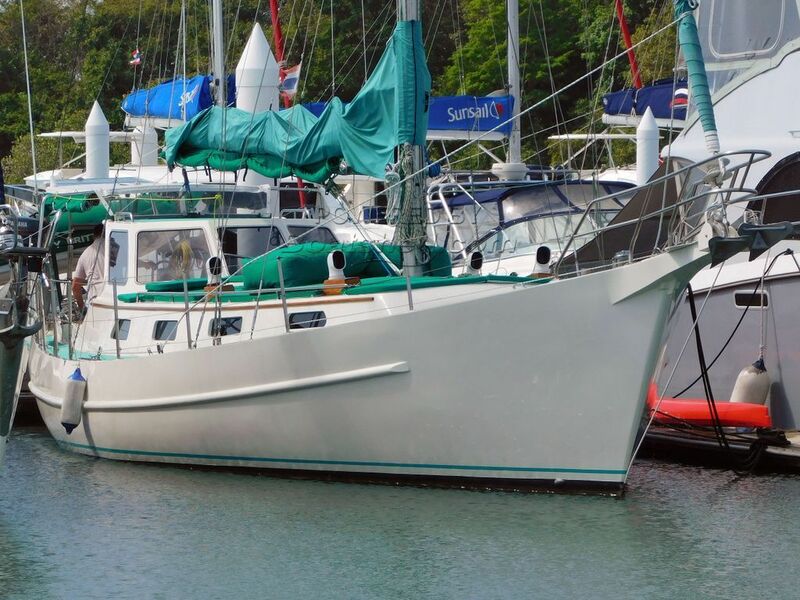 Sold again in 2015 to her current owner and sailed to Thailand where she was again re fitted for the owners intention of long term single handed sailing. Unfortunately the owners plans have had to change and following another refit this striking vessel is offered for sale ready to go. Install diving / fishing platform and deep ladder. Install new radar, 2 new plotters, GPS, fish-finder and new autopilot with remote. Install up-down switch to control anchor windlass from cockpit. Install 80 m of new anchor chain. New cushions, inside and out. Open, clean and repaint water tank. Open and clean fuel tank. Replace 50% of the plumbing system and add water filtration system. Install new shower / sink sump and pump. Replaced all windows with tempered glass. New paint inside and out. Installation of rope cutter on shaft. Davits extended for better dinghy lift. Ultrasonic antifouling system with 4 sensors. This Adams 45 Steel Sloop has been personally photographed and viewed by Alan Giles of Boatshed Phuket. Click here for contact details.